Reports allow the merchant to view and reprint past transactions processed through the Retail ePay Charge software. Transaction reports will be available for 90 days at which the new transactions will replace the old transactions. For more details on transactions processed through the Retail software, refer to the Merchant Console transaction details. To view the “Transaction History”, click on Reports -> View Reports. The Transaction History is a basic straightforward layout. 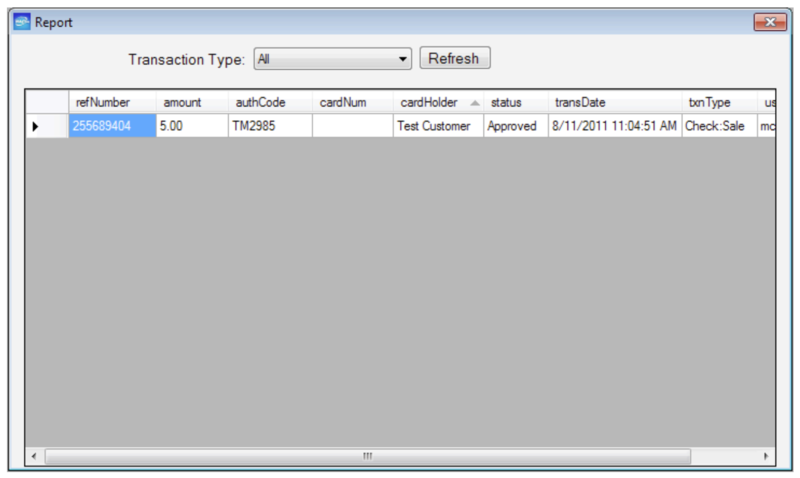 By default, transaction history displays all the transactions processed through the retail software. To view specific transaction, click on the “Transaction Type” drop down menu box and select the type of transaction report to view. To reprint a receipt, you must first have a printer selected in your device manager, select the transaction line and press the “Reprint” button next to the “Refresh” button.